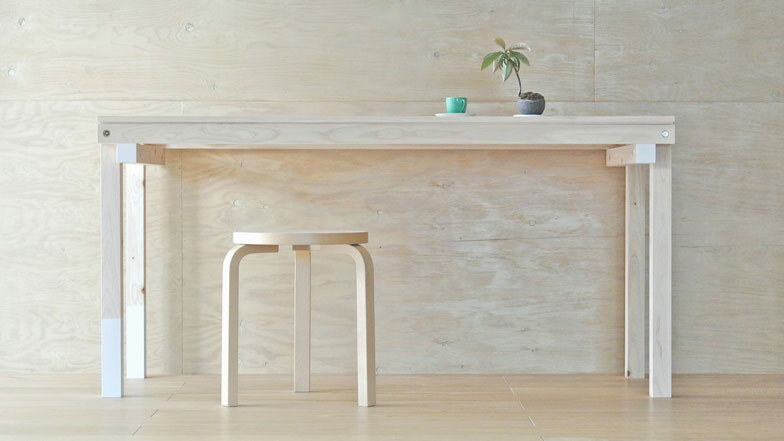 Eight poles and a board made of forest waste bolt together to make a flat-pack table by Japanese designers Hiroyuki Miyabe and Jun Yoshimura of SPEAC. Called For Rest Table, it can be bolted together easily and has been painted with accents of white at the end of some sections and the bottom of two legs. It's made from thinnings of hinoki cypress - a slow growing tree predominantly found in Japan - that would otherwise be thrown away. Back in 2008 we featured the renovation of an ivy-covered house by SPEAC. Take a look at it here. The name of this table is For Rest Table. This name has double meanings. The first is “For rest”. The second is the wish for revival of sustainable environment of a forest. We know that healthy circulation of forest thinning waste is indispensable to revive and sustain Japanese forest. This table is one of the effective utilization of sustainable wood. This table is sectional and consists of one plate and 8 poles. We can put together very easily without special tools. All parts are made of Japanese cypress “Hinoki”. And we can enjoy very good texture and fragrance of wood. These parts of the table can be packed compactly. We can ship saving cost and energy.